Last time I wrote how to combine C and Java for Android app to load textures. I also mentioned I will write some short article on how and why to use JNI_OnLOad() method. So, here it is. JNI_OnLoad() - am I forced to use it? The answer is: no. If you do not want you do not have to implement this method. But if you do so you can gain some benefits from it. These benefits includes java class instance caching and native method registration. The example was taken from Android NDK example hello-jni.c. In the name of the method you have to put in "Java_". Then the whole package name "com.example.hellojni" but with dots replaced with underscores. Then class name "HelloJni" and finally the name of the native method. Of course, you can use javah.exe to generate this for you but it would be better to bypass it somehow. On the top there are two variables: gJavaVM and gJavaActivityClass (g means these methods are global). In these variables I will cache object that I use during game in it (remember using it in previous article on loading textures). Next is constant string that contains Java package name and Java class that contains native methods. The dots are replaced with slashes. However, note that every single native method takes as its first two arguments "JNIEnv* aEnv" and "jobject aObj". These arguments are not part of method signature in registration table but you have to include them. This snippet will focus on loading images on Android NDK using JNI. Our cross-platform mobile engine runs on Android, bada and desktop Windows. In last part I described two ways how to load images on Windows platform. Similar to that I again wanted solution that will load .png image as well as .jpg image. The solution that works good for me is split into C and Java part. 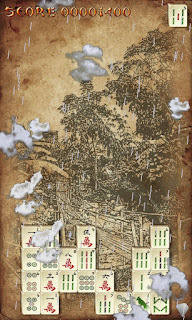 The actual image loading and texture creating takes part in Java part. It also works either in fully native app with its C main loop and using native_app_glue or in Java app with GLSurfaceView.Renderer calling native methods in onDrawFrame method. The java part not only loads image but also creates openGL texture for me. If you are interested only in loading the image you will have to adjust it a little for your needs. The initial part of the method is split depending on whether you are using native_app_glue or not. If yes then first call to getApplication is actually returning android_app* type. This structure is part of parameter list of native main method. In my engine it is typedefed to SBC::System::Application (typedef struct android_app Application;). If you are not writing fully native app then you will have to use some variables previously cached (gJavaVM, gJavaActivityClass). I am caching it in JNI_OnLoad which is called when native library is loaded (see another article on JNI_OnLoad). The main things are going on in java class. I call it Tools as the image/texture loading is not its only purpose. But only this is subject of this article. In the beginning I just open file fname for reading. The second parameter beyond the file name (int id) is used when using compound files (single file made from multiple other files with some offsets header in the beginning). If using single file then this parameter contains -1. After the file is opened I can start loading the image. Again there is split depending on whether the file is compound or not. // loading from compound file? If yes, we can continue to creating OpenGL texture from it. First we also check whether the image height and width is power of 2. If not we put message into log and then we convert it to nearest power of two image. It is probably pretty stupid to call three methods to get texture first and then to get its width and height. Better way would be to return some kind of object with three members. But it works and as I will get deeper into NDK/JNI I will adjust it in future. I hope this article helped you to write your own image loading class. The final class can load OpenGL textures from .png, .jpg files in your asset directory and it can also adjust images that are not power of two to make OpenGL happy. WIC was the first way. The following routine will load image (.png, .jpg, ...) and return unsigned char* to raw RGBA data. You can take this data and create texture from it. You will also have to add library windowscodecs.lib. // Retrieve the first bitmap frame. // Initialize the format converter. In this way the loading of images worked fine for me. But our graphician got only black screen. And you will agree that black screen for someone whou should see how his graphics looks in game like is not good at all. It seems that WIC is supported from Windows XP SP3. And "something missing" is probably the reason why it returned only black screen. As I had no opportunity to test on his computer I started to look for something that is less dependant on windows versions. I found open source library FreeImage. 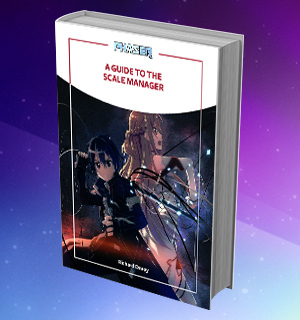 FreeImage has very clearly and well written documentation with lot of examples. The library is capable of many things but my only target was to load image (regardless the format at the best). So, to make FreeImage work download the header, .lib file and .dll. Set path to header and to FreeImage.lib file. // unless a bad file format, we are done ! So, here are two ways how you can get image data for your textures. 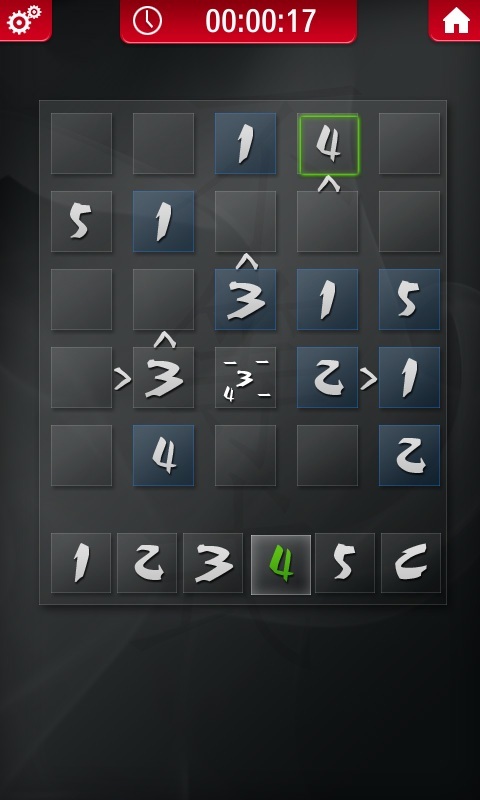 Next time I will write how is this achieved for Android platform in my engine using NDK and JNI. After introduction in "Simple cross-platform game engine - Introduction" there is first of the snippets here. 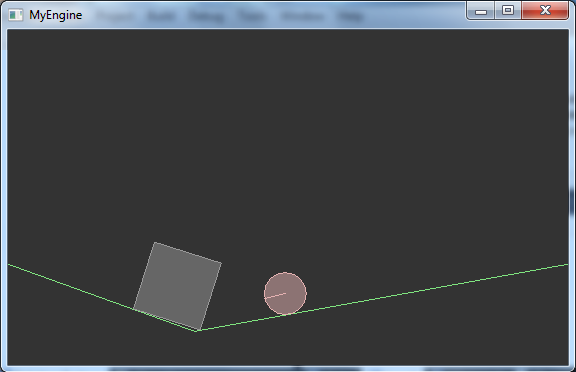 This time it is on implementing debug draw class for great Box2D physics library. 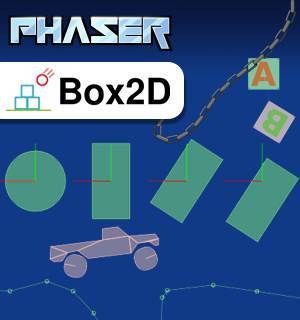 I am very new to Box2D, but the library is very well documented and easy to use. I implemented it into Android NDK and Win platforms of my engine. I tried to create simple world with two objects and two edges but then I found that I am missing some class to draw it on screen without textures and all the stuff around. First I looked into packed source that comes with whole Box2D package and found class DebugDraw in Render.h/.cpp in Testbed\Framework directory. Unfortunately this class is using "big" OpenGL with calls that are not supported in "small" OpenGL ES. After some searching I found iPhone implementation. Class GLESDebugDraw supports only OpenGL ES 1.x while in my engine I can switch in parameters whether to use OpenGL ES 1.x or 2.0. As I did not find any implementation for 2.0 I had to write one by myself. Box2D has class b2Draw in its Common directory. This class contains a bunch of virtual methods that waits for your implementation. The following implementation is bind to my engine but very loosely so you can take it and with small adjustments it will work for you too. I will mention these bindings during the text. lines 66-71: pointer to class wrapping OpenGL program and cached locations of some of the uniforms and attributes. As you can see the implementation depends on chosen OpenGL ES version. If everything went ok, you should get something similar to picture bellow and the best thing is it works for both OpenGL ES versions just with simple define switch. In attached file here you will find whole implementation and also source for referred classes (fvec2, glesProgram). So it should be enough help for you to implement your own drawing class. 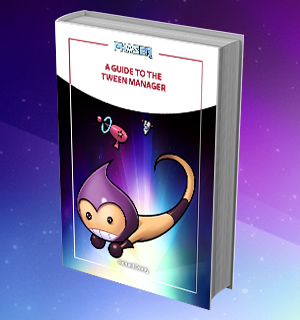 This is the first one from series of planned articles on writing small and simple cross-platform game engine. In the articles I will write about topics and issues I encountered when writing our SBC Engine. As I am amateur programmer the professionals among you may find some of my solutions stupid or not effective. And it may be truth. 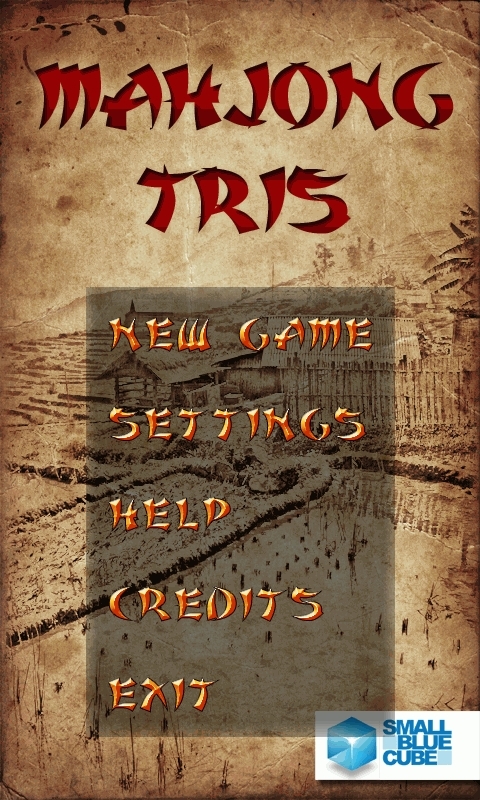 But I am happy with our engine as it already helped us to create two games (Deadly Abyss 2, Mahjong Tris). More, the engine is still evolving and I am planning to improve it in every direction. So, your comments are welcome. Why should I write my engine? Of course you do not have to. You can use any of the available engines out there. But be sure that doing it will definitely improve your coding skills as well as it will increase your object thinking. In your engine you can freely implement any features that you are missing somewhere else. You are not restricted to write everything by yourself. You can still use third party libraries like Box2D or so. Currently the engine works for Android and Windows desktop. Samsung bada is half way implemented. Why implement such a strange system like Windows desktop for mobile engine? Ok, when running it in MS Visual Studio you have very fast debugger and you can also simply share the project progress with other team members that may not own real Android device. But it has other features. For example if you, in development phase, let assets unpacked your grafician can replace them simply in assets directory and see how it looks in game. On the very bottom is sitting real system you are running the game on. Every system has different APIs and different behavior so you have to unify it somehow. This unification takes place in box labeled System. There are specific claeses for each supported system (vertical boxes with system names). These classes are converting the calls into so called services that appears to the rest of the engine identical regardless of the actual system. For example there is TimeService that is responsible for timing the game loop, measure how much time elapsed from last tick and so on. This class also can return current ticks in milliseconds when getTickCount() is called. On some systems it only passes the query to the underlying system and returns the result while on others it may do some calculations with system returned values. From engine point of view all this is hidden and when programming new engine features you just call getTickCount() and you are not interested more how the result is created. The relation between these system classes and real OS is one-way. You know about the system but the system does not know anything about your classes. 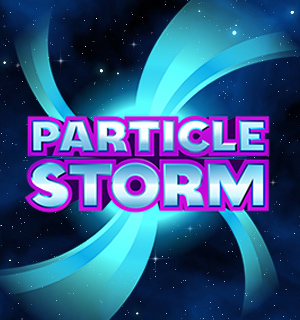 It sounds natural in this level but may not be so obvious in creating further, higher level, parts of the engine. 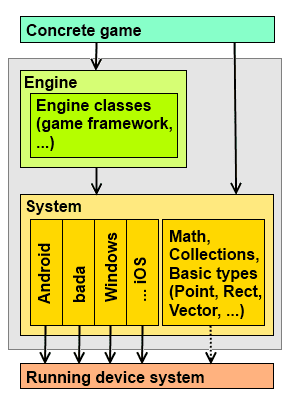 This one way relation is also applied on Engine -> System relation and Game -> Engine and Game -> System relation. It allows you to write new game without changing engine and also it allows you to develop new features in the engine without changing System layer. Beside the system specific services you can also see other classes in the System layer. These classes are here to define very basic types like Point, Rectangle, Vector, Dimension, ... Point, Vector, Dimension are all just typedefs for the same. Giving it different names helps to maintain code readability (I am sitting on the "chair" not on the piece of "furniture" while both is right). The arrow pointing to underlying system is dotted as some of these classes may encapsulate something from system while others not. For example the Math is there to create unified access to math functions across systems while Vector is independent template class. Because of this system dependent / independent mixture I left all these classes in System layer instead of implementing it in Engine layer. Beside this I expect Engine layer to provide one step higher operations than just define Rectangle or any other basic class. 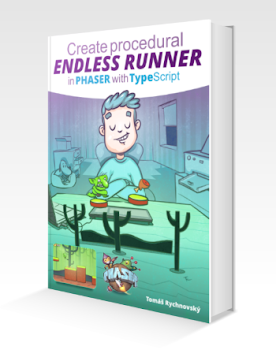 Engine layer then defines operations above system, basic classes like batching sprites for renderer, managing assets, managing texture regions, handling game lifecycle, ... Here any ideas about what your engine should be capable of can be implemented. Of course, there are lot of times when for some feature you will have to open the System layer and adjust it. But it does not violates the rule that System does know nothing about Engine. For example if you want to add some camera features into engine you will have to create camera service in System layer. 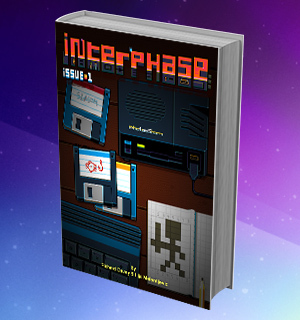 On the top of you engine that consists of System and Engine layer you then build your games. If the engine has all the features you need for actual game you are working on then your role is "game programmer" and your previous role "engine programmer" can be forgotten until game programmer asks engine programmer to implement new feature. This is last from our short articles presenting our recent projects. This time it is Futoshiki also known as unequal. 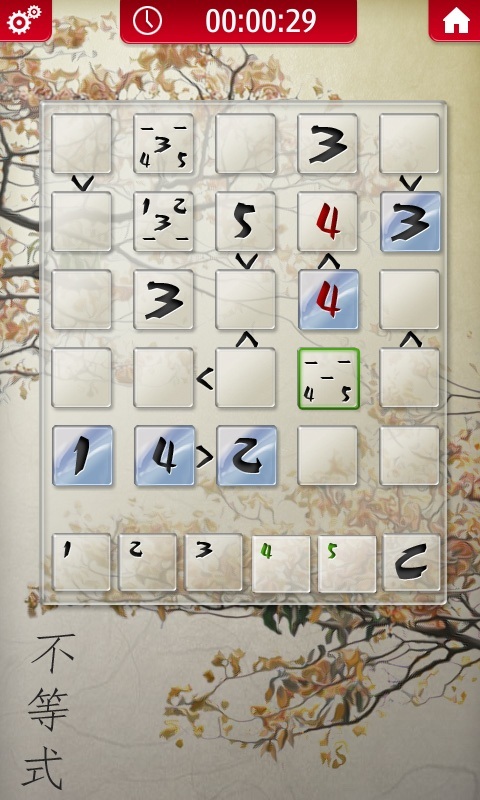 It is another Japanese puzzle similar to sudoku while with different experience. I made this game as I was fascinated how big scale of problems from easy to really very hard can be presented on small 5x5 grid. 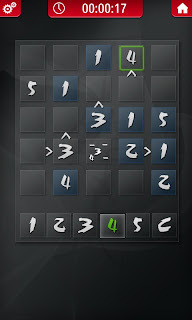 The game contains infinite number of puzzles in three difficulties - easy, medium, hard. 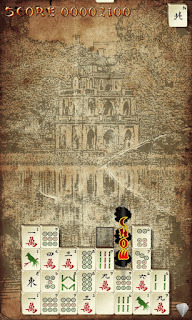 Every time you select new game the original puzzle is generated on the fly. It is tested for uniqueness of the solution as it is not fun if there are more than one solutions. 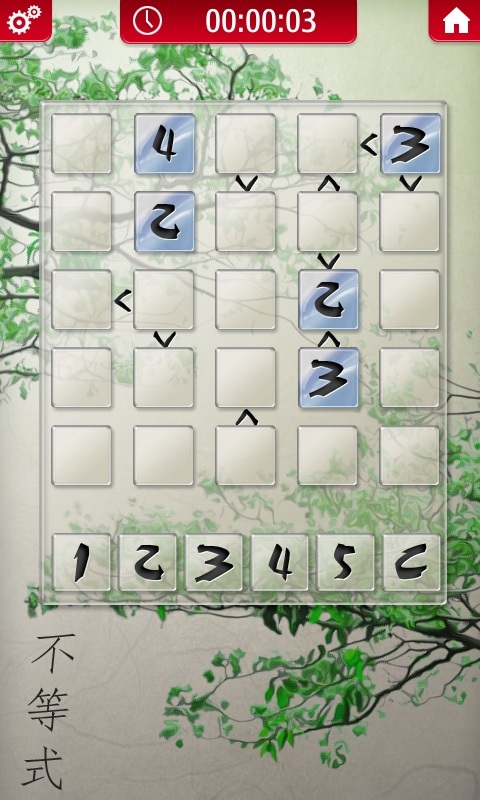 To properly rate the difficulty the game contains also solver that is solving it with about 9 logic patterns. Every pattern occurrence is rated with some mark which in total gives difficulty rating. This was our first game for Android and it was made in times when I did know nothing about Android programming UI thread and so on. So, the generating of the puzzle which may take few seconds runs on UI thread which is not good as it may pop up "not responding" message. But if you have decent average phone it runs all OK. 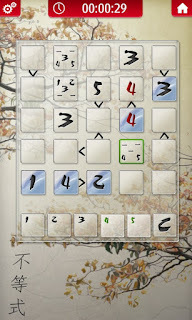 The game is free so if you are sudoku lover and feel little bit tired with it lately try this game. There are also several skins inside - the dark one, bright and seasons. Under seasons there are 4 randomly chosen sub-skins for spring, autumn, summer and winter. Get the MahjongTris Android app from SlideME. 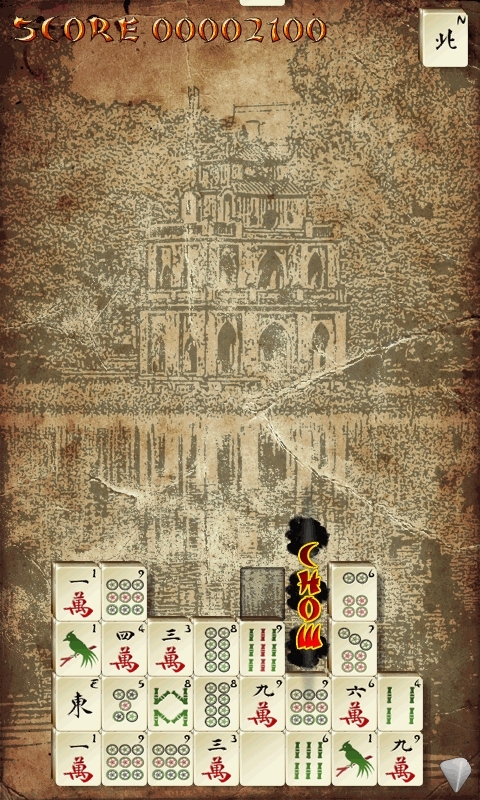 About 14 days ago we released Android version of our older game Mahjong Tris. The game was originally written for Samsung OS bada as an contest entry when this new OS was introduced. We placed among top 300 qualifiers and as a reward we got new Wave I phone. The game is experimental combination of mahjong tiles falling from top in tetris style. 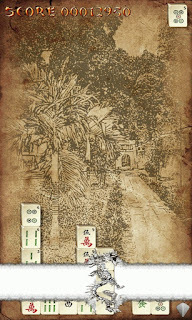 For Android the game was completely rewritten into our small cross-platform engine. The original game was made in rush but it has very nice graphics by Jupiter and very catchy music tunes from Honza Dušek. 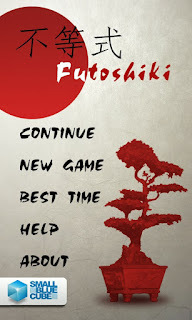 For Android the game is free so do not wait and download it! As already promised, in future articles I will describe the snippets from building our cross-platform engine. But before that I have to write one more post with presentation of our Futoshiki game.